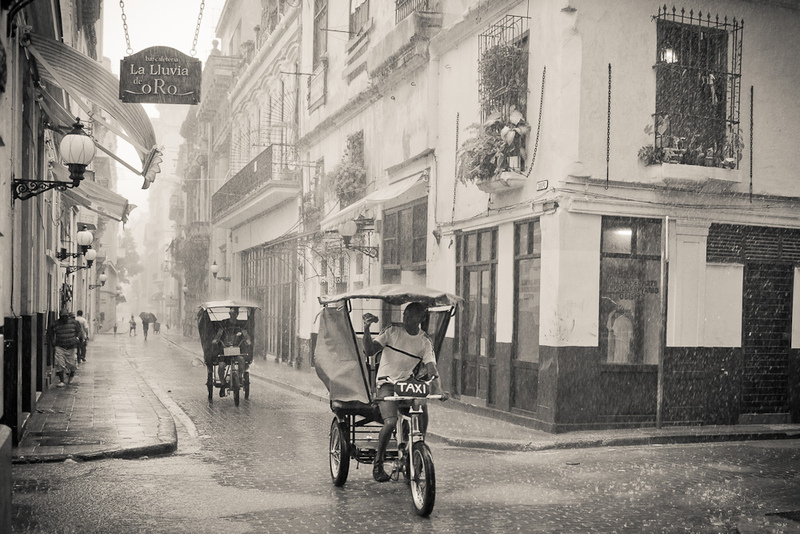 Unexpected, sprinkles of rain fell made many of us glance at the skies while walking from Ernest Hemingway’s Havana home (called “Finca La Vigia”) to our group’s Chinese made Transtur tour bus. No one, especially those Americanos who live in rainy areas thought much of the slight drizzle. But, for drought stricken Southern Californians the approaching pitch black clouds were a bit of wonderment. San Diego, for example, only records ten inches of rainfall for an entire year. Remember that stat for later. 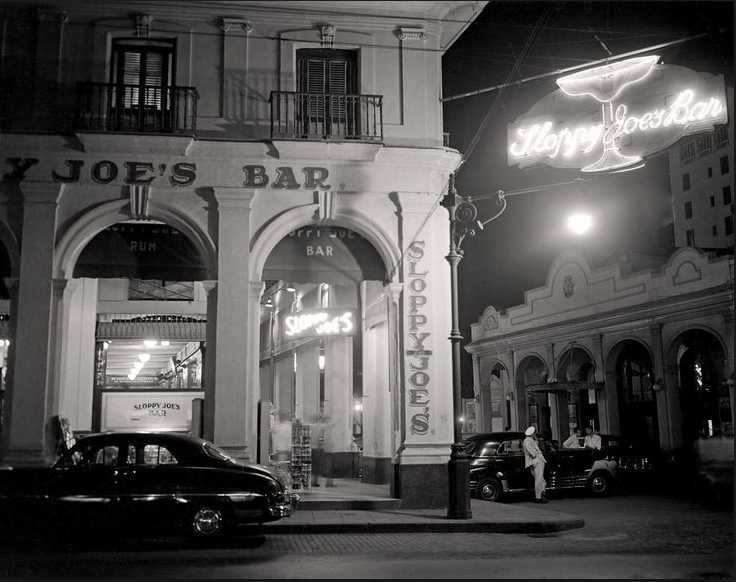 Doubtless, Hemingway made the same ten mile trek (1939-1960) from his home, where he penned the Nobel Prize winning “Old Man and the Sea” to old Havana. Today, followed the same streets to the Hotel Nacional de Cuba, where we were booked for several days. We were at the tail end of a ten-day group tour of Cienfuegos, Santa Clara, Trinidad, Bay of Pigs and Havana. It was one of those government to government tours still popular and available today. Half way there the proverbial heavens opened up. Lightning, thunder and torrents of rain immobilized pedestrians and small vehicles. 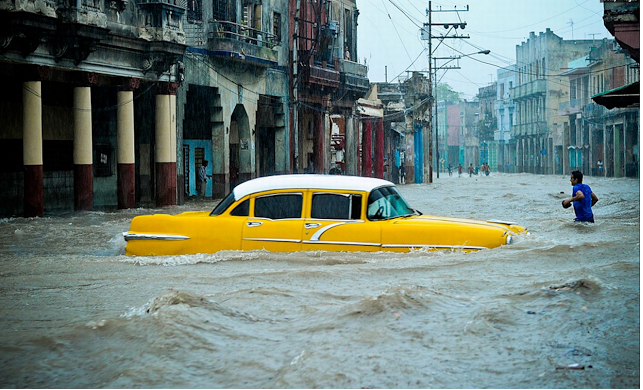 Instantly, streets were rivers of runoff. A few cars spun out into the medians. Again, if you’re not used to big storms, this ride was awesome. Fortunately, the bus was able to park next to the covered front door of the huge hotel. We were high and dry as the hotel is built on a bluff facing the Caribbean. From the eighth floor, we opened the north facing windows to capture the smell of the big storm. Then, the sky illuminated what had become dusk over the capital city. Lightning blinded us and milliseconds later the roar of thunder sent us for cover in the safety of our suite. “Wow, that was close,” gasped my son. “Someone have the sense to close the windows,” said his mother. The tropical storm continued for several hours. “Wasn’t this the night you were going to explore the nightlife?” she said to us. We heard the bubble bath water running in the tub. Great idea. 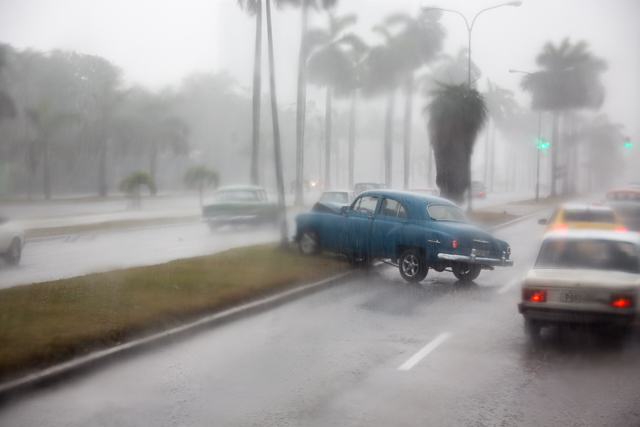 The boys night out in Havana began with the same drizzle that we encountered at Hemingway’s home. We didn’t need the umbrella but we took one anyway. 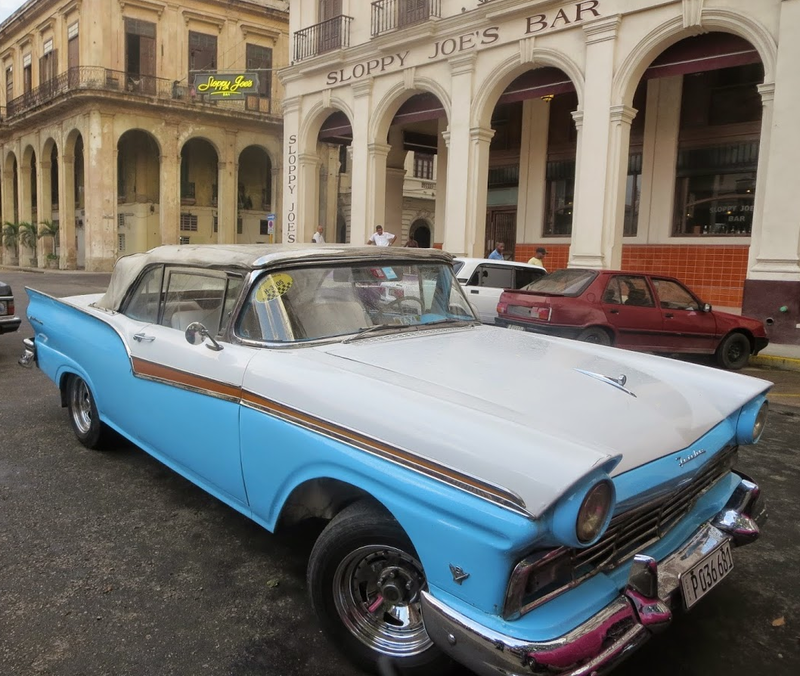 We found a 1959 blue and white Ford Fairlane convertible that was now a Havana taxi. We asked if we could ride with the top down. He said no in Spanish, Japanese, English, Russian, Chinese, Czech and North Korean. Turned out those were the same nations where all the repair parts for the old Ford came from. The shell of the Fairlane was all that remained. Engine: tractor engine from Japan. Rebuilt Carburetor: Smuggled in from Miami by his brother-in-law. Our Lady of Guadalupe bobble head doll on the dashboard from Mexico. “Gee, I wonder, which grandpa said that?” Mike said. 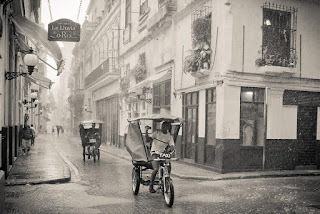 An hour or so later, we hopped a covered three-wheeled bicycle rickshaw peddled by a Havana teen, who earned every bit of his fare peddling us across town to Plaza Viejo. There we stopped Havana’s newest and best craft beer brewery. Even on a Sunday evening the nightlife was filled with conversations and music. It was a priceless evening being in Havana with a son. We ended the evening taking a modern Russian made taxi back to the Nacional hotel. 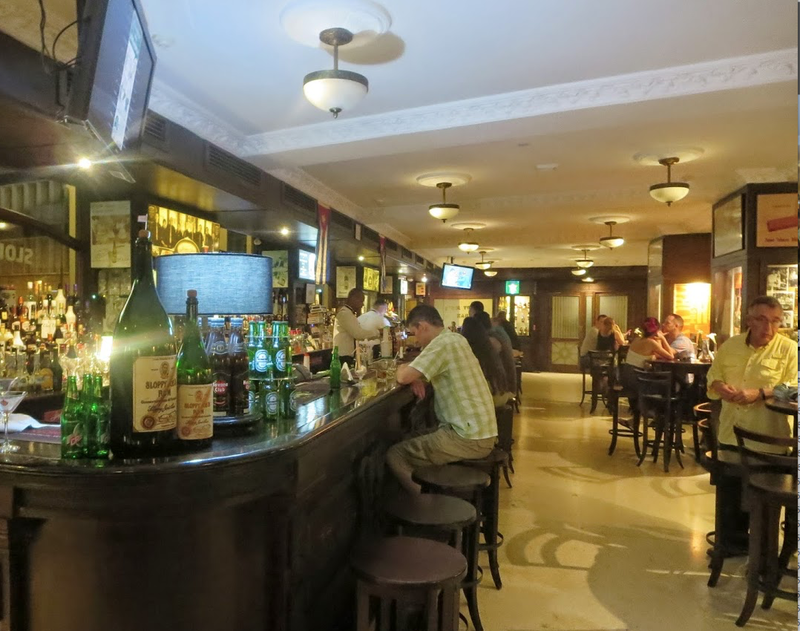 There we found the Churchill Bar, where I “popped” for a 25 year old Port and my orange soda chaser, plus two delicious Cuban made cigars. The staff didn’t mind it one bit as we puffed away on our Cohiba Esplendidos. Now, tell me how in the hell can a father answer a question like that? “Of course,” I was careful to answer quickly. It was same answer I gave to his brother in Spain.